New context, new rules. I have these cut off sweat pants that I work out in. I appliqued a chinoiserie star onto the booty of the shorts! They elicit some commentary, always positive. But I can't help but wonder if people, namely women, are thinking "What kind of woman appliques a star on the middle of her workout shorts!" This kind, I suppose. 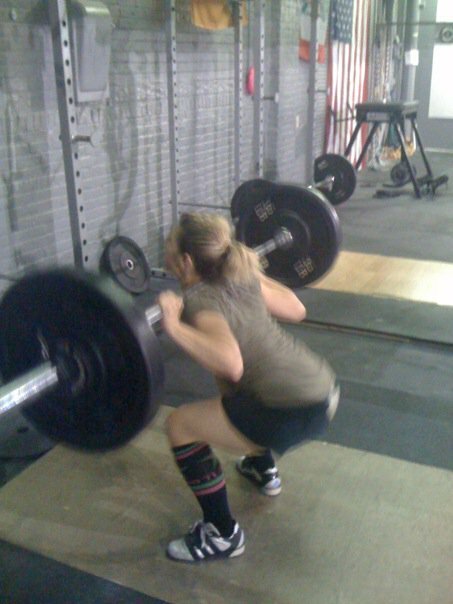 I changed gyms in October; Women's Workout World (all women) to Windy City CrossFit (coed). I auditioned to be a Turbo Kick Instructor at W3 and made the shorts so people can follow me on stage. Plain and simple. You may remember the story of my first audition here. You may notice the difference in body composition since one year ago. I was about 13 lbs heavier back then and worked out way more. It's intensity folks and a quality diet. Not cal in/cal out. You Facebook friends know I eat like a truck driver. I was not born with a fast metabolism at all. You all need to know the truth, but I'll save it for another post. Looking back I am so glad I didn't get the job! I've joined CrossFit which incorporates "high intensity training". Had I been tied to an instructor job, I doubt I would have made the switch. Heck, I was intimidated enough to go to CrossFit. But the heavily tatooted young thing that did my ramp up was super nice and non-judgemental. Don't be scared. It's exercise for the time-conscious person. It uses anaerobic and aerobic energy pathways. I workout for 1 hour 3 times a week and have gotten better results than working out non stop for 1.5 hours 5 days a week. Believe it. Just come talk to me. Talk to the people who went to W3 with me and are now at CrossFit (Ok, only Carmen but she is a rockstar! strong crazy woman!). In the meantime, if you want you want to judge me for wearing a star my booty, go ahead I can't stop you. You're probably just jealous. If that's the case, just fess up. I have plenty or star cutouts for your old shorts. Just ask. I make my own allergy-free, dye-free, crazy-words-I-can't-pronouce-free clothing detergent. It's pretty cheap and easy to make. It is a great deodorizer for sports clothes and awesome at getting out stains in clothing, but remember to use a scrub brush. I even got out the dirty salt stains on ski coats. If you live in a cold climate, you know that gray dinge jackets accumulate regardless of how often you wash it. Yep, scrub brush and my natural detergent. You can find everything at a grocery store in the laundry aisle. Mix all ingredients together. I put it all in a food processor and process it until it is fine. 2 TBL per load is all you need and it's safe for high efficiency units also. Me and the girls have been quite busy launching Spring in Chicagoland. We've had some extremely warm days and enjoyed them thoroughly with picnics, outings and late nights. One standout happened recently when the girls and I particpated in the Linus Project. 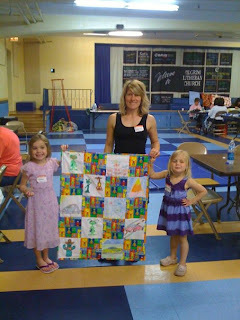 The girls painted quilt blocks with fabric markers and I stitched it all together to create a quilt. The quilts from Project Linus are donated to kids in the hospital so they have something special. 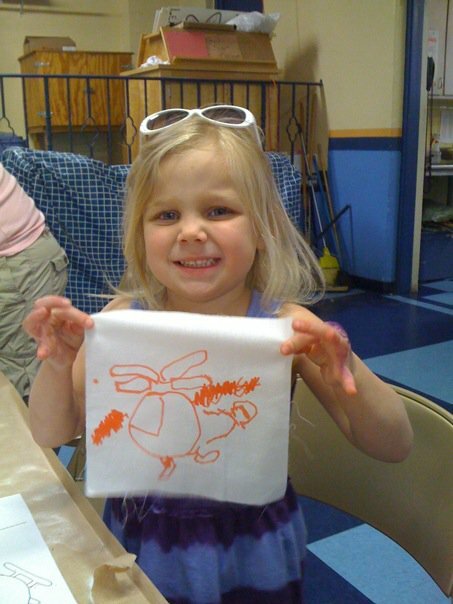 Created by kids, for kids. I love the concept. The girls had a blast and loved that I put my sewing skills to good use. I do love sewing but loathe being trapped indoors to do it.